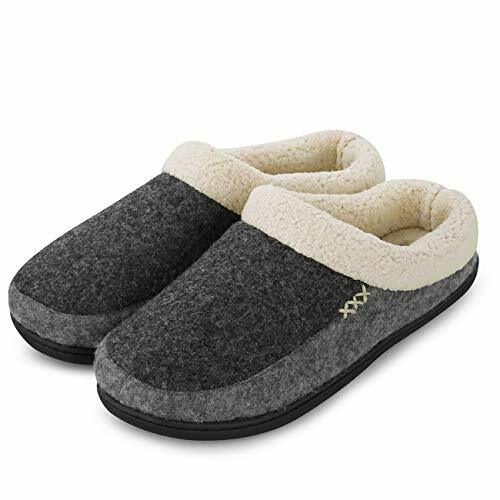 COZY PLUSH FLEECE LINING: Comfortable microfiber upper and wool-like plush fleece lining, these slippers can offer you a new wearing experience, they'll keep your feet warm and comfortable on cold autumn and winter nights. ANTISKID & DURABIE: The improved durable and soft waterproof TPR soles is a great choice for indoor and moderately outdoor use if you insist. Anti-skid texture in the bottom gives you safe and secure footing and prevents scratching the floor. 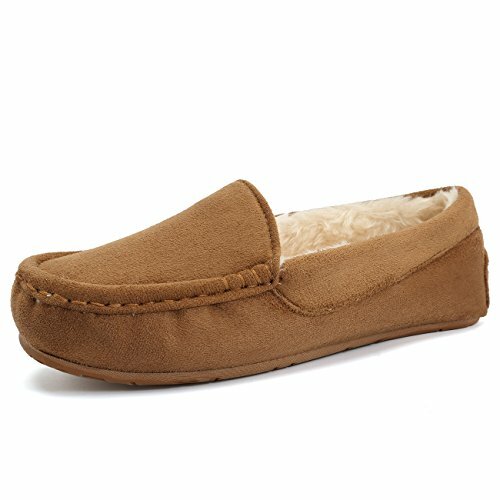 COMFORTABLE & WARM: High quality insole consists of one layer of premium thickened high-density memory foam + one layer of high elastic sponge heel, offers lasting marshmallow-like comfort and warmth for tired toes and heels, reduces muscle fatigue, relieves pain and pressure after a long day hard work. EASY CARE: Machine wash with a laundry bag or hand wash, easily clean off stains or dirt. 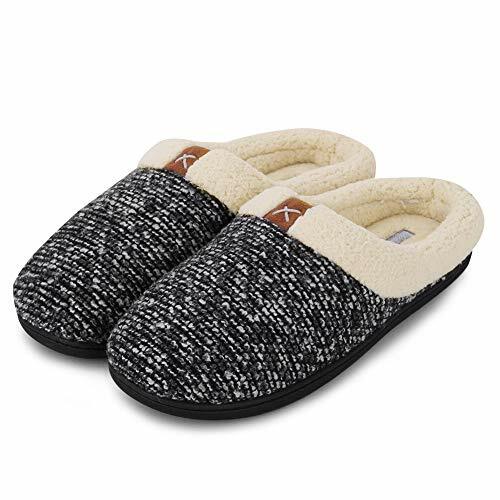 MULTI FUNCTION: Great house slipper, suitable for cooking in the kitchen, playing with your kids, drinking afternoon tea in the courtyard, walking to the mailbox, taking out the trash, watering the lawn, walking the dog, or going out to sign for parcels. A great gift to pamper your tired feet with a well deserved rest. ★★Sizing tip: Please ignore the size on the shoes and choose your right sizes based on the listing. EASY CARE: Machine wash with a laundry bag or hand wash, easily clean off stains or dirt.EASY CARE: Machine wash with a laundry bag or hand wash, easily clean off stains or dirt. GOOD HYGROSCOPICITY & PERMEABILITY: These slippers are made of high-quality and superior cotton-blend texture, combined with waffle design that could stop your feet from continuous stuffy feeling. 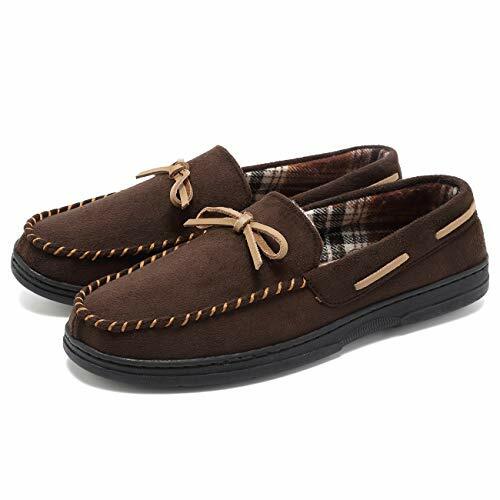 The excellent and soft cotton material also absorbs the sweat from your feet quickly after a long day walking. 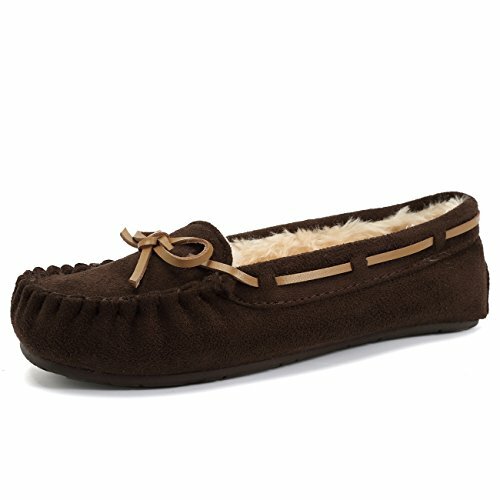 They could be perfect for all seasons, especially for spring, summer and autumn. ANTISKID & DURABIE: The improved durable and soft waterproof TPR rubber soles is a great choice for indoor and moderately outdoor use if you insist. Anti-skid texture in the bottom gives you safe and secure footing and prevents scratching the floor. 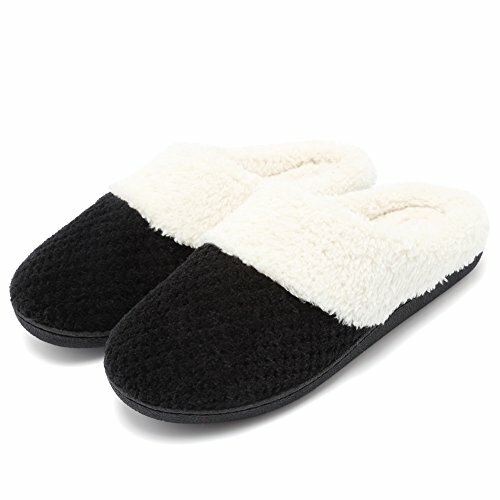 COMFORTABLE & WARM: High quality insole consists of one layer of premium high-density memory foam + one layer of high elastic sponge heel, offers lasting marshmallow-like comfort and warmth for tired toes and heels, reduces muscle fatigue, relieves pain and pressure after a long day hard work. ★★Sizing tip: Please ignore the size on the shoes and choose your right sizes based on the listing. EASY CARE: Machine wash with a laundry bag or hand wash, easily clean off stains or dirt. 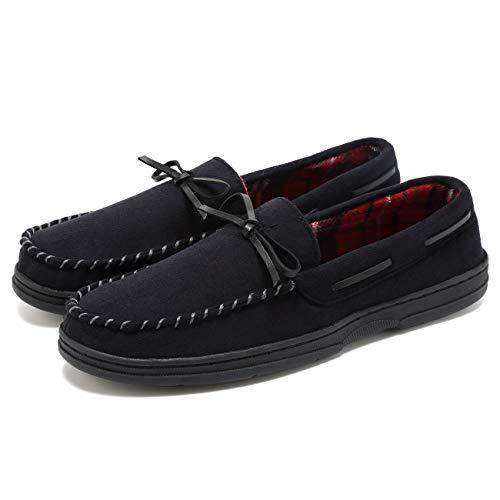 EXQUISITE CRAFT: Breathable microsuede upper with exquisite whipstitch, fully lined with soft microfiber, these moccasin slippers are in fashion design and keep your feet warm and comfortable on autumn and winter nights. 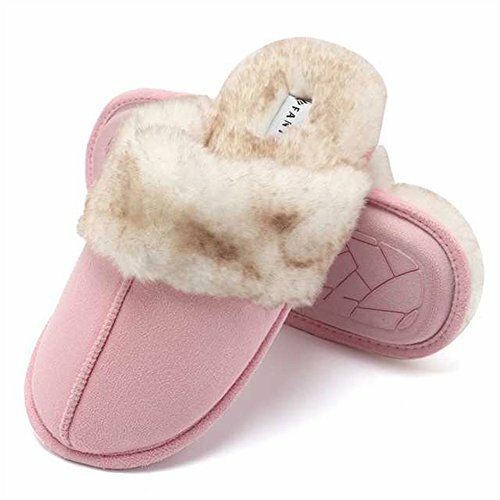 COMFORTABLE & WARM: High quality insole consists of one layer of premium high-density foam + one layer of elastic sponge heel, offers lasting comfort and warmth for tired toes and heels, reduces muscle fatigue, relieves pain and pressure. 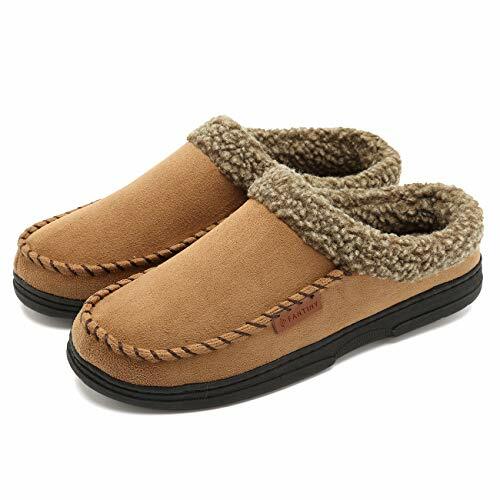 MULTI FUNCTION: Great house moccasin slipper, suitable for cooking in the kitchen, playing with your kids, drinking afternoon tea in the courtyard, walking to the mailbox, taking out the trash, watering the lawn, walking the dog, or going out to sign for parcels. A great gift to pamper your tired feet with a well deserved rest. 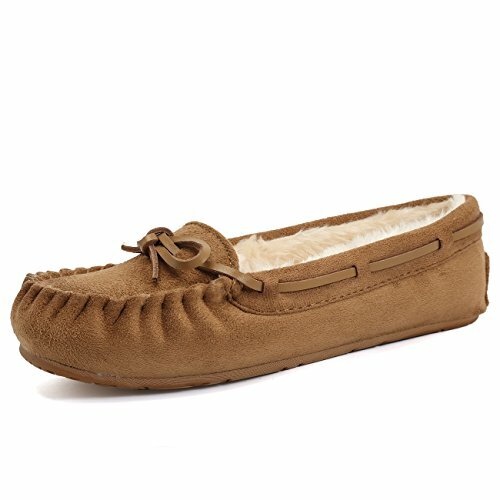 EXQUISITE CRAFT: Breathable micro suede upper with exquisite whipstitch, fully lined with faux fur, these moccasin slippers are in fashion design and keep your feet warm and comfortable on cold autumn and winter nights. 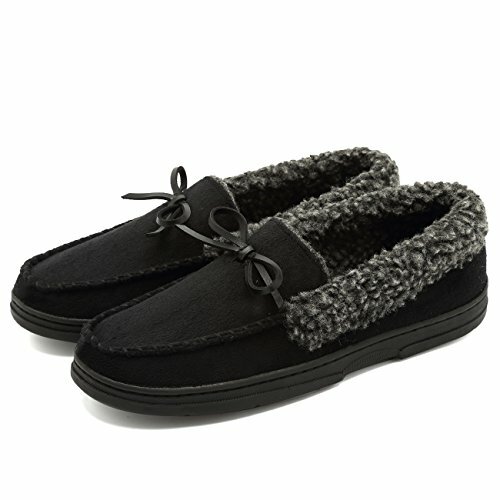 EXQUISITE & COZY UPPER: Sweater knit upper with super soft faux fur collar, just as cozy and comfy as real fur, these slippers will keep your feet warm and comfortable on cold autumn and winter nights. 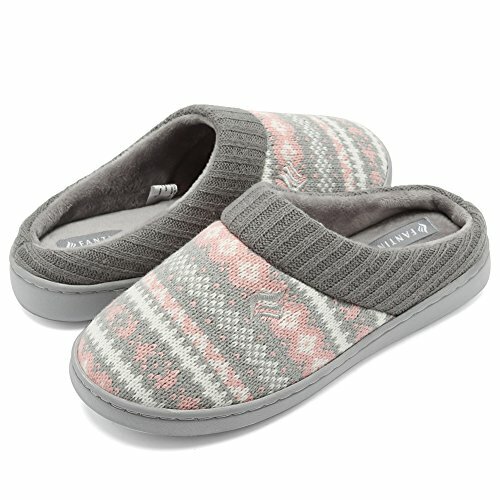 COMFORTABLE & WARM: High quality insole consists of one layer of premium high-density memory foam + one layer of high elastic sponge + one layer of high elastic sponge heel, offers lasting marshmallow-like comfort and warmth for tired toes and heels, reduces muscle fatigue, relieves pain and pressure after a long day hard work. 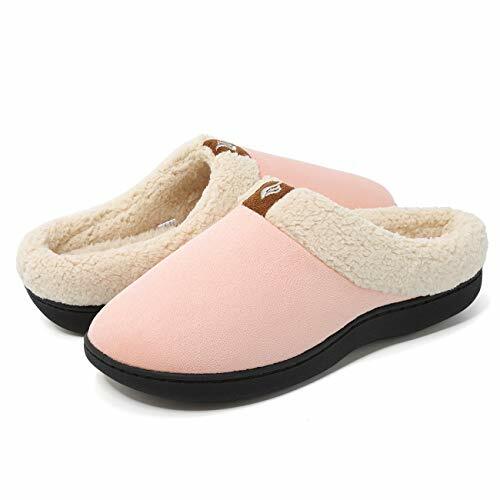 COZY CORAL FLEECE UPPER: Comfortable coral fleece upper and ultra-soft coral plush lining, these slippers can offer you a new wearing experience. 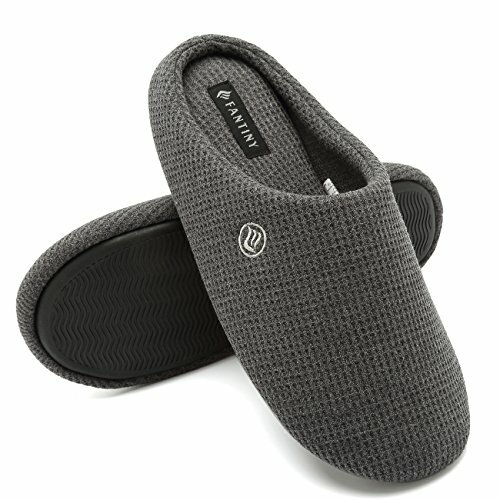 ★★Sizing tip: These relaxing house slippers might feel a little tight at first, but stretch out a bit after a week. EASY CARE: Machine wash with a laundry bag or hand wash, easily clean off stains or dirt. 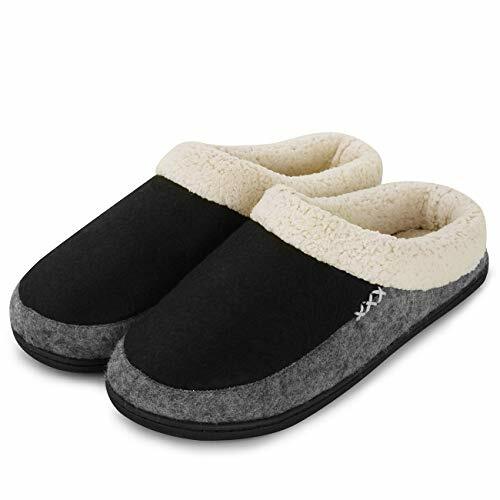 MULTI FUNCTION: Great house slipper, suitable for cooking in the kitchen, playing with your kids, drinking afternoon tea in the garden, walking to the mailbox, taking out the trash, watering the lawn, walking the dog, or going out to sign for parcels. A great gift to pamper your tired feet with a well deserved rest. EXQUISITE & COZY UPPER: Sweater knit upper with embroidered pattern and ribbed hand-knit collar, just as cozy as your favorite sweater, they'll keep your feet warm and comfortable on cold autumn and winter nights. ANTISKID & DURABIE: The improved durable and soft waterproof TPR soles is a great choice for indoor and moderately outdoor use if you insist. Anti-skid texture in the bottom gives you safe and secure footing and prevents from scratching the floor. 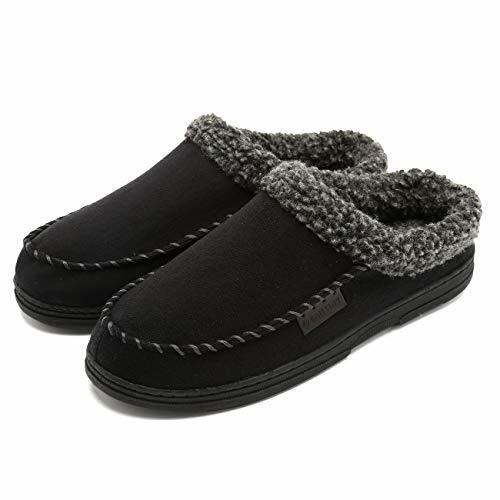 MULTI FUNCTION: Great house slipper, suitable for cooking in the kitchen, playing with your kids, drinking afternoon tea in the garden, walking to the mailbox, taking out the trash, watering the lawn, walking the dog, or going out to sign for parcels. ★★LIFETIME WARRANTY! We're so confident in the quality of our slippers that we offer a 100% Lifetime Warranty. Whichever point you're not satisfied with your purchase, you're welcomed to return it for a free replacement or get a full refund. 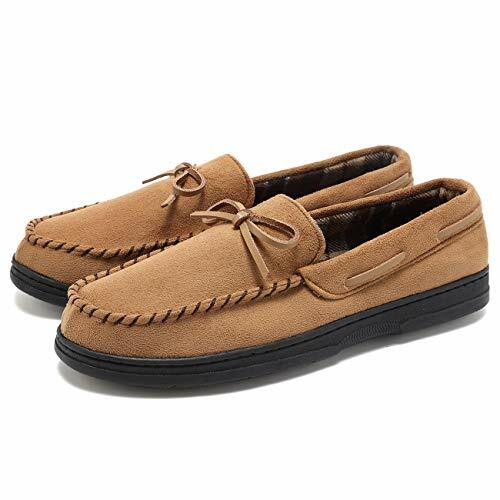 EXQUISITE CRAFT: Breathable suede upper with exquisite whipstitch, fully lined with faux fur, these moccasin slippers are in fashion design and keep your feet warm and comfortable on cold autumn and winter nights. 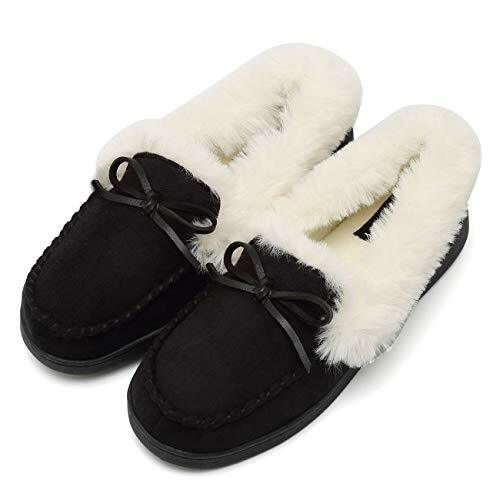 EXQUISITE CRAFT: Breathable micro suede upper with exquisite whipstitch, fully lined with faux fur, these slippers are in fashion design and keep your feet warm and comfortable on cold autumn and winter nights. COMFORTABLE & WARM: High quality insole consists of one layer of premium high-density foam + one layer of high elastic sponge heel, offers lasting comfort and warmth for tired toes and heels, reduces muscle fatigue, relieves pain and pressure after a long day hard work. 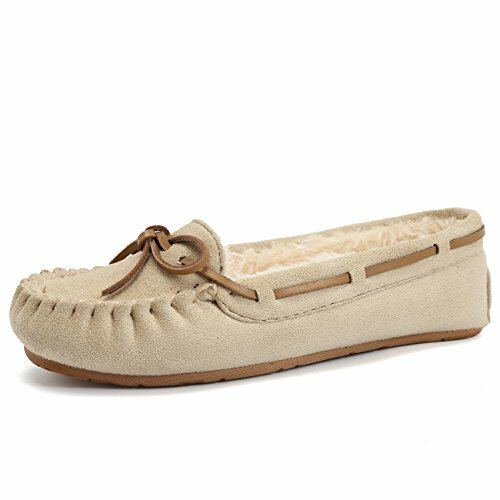 EXQUISITE CRAFT: Breathable microsuede upper with exquisite whipstitch, fully lined with faux fur, these moccasin slippers are in fashion design and keep your feet warm and comfortable on cold autumn and winter nights. 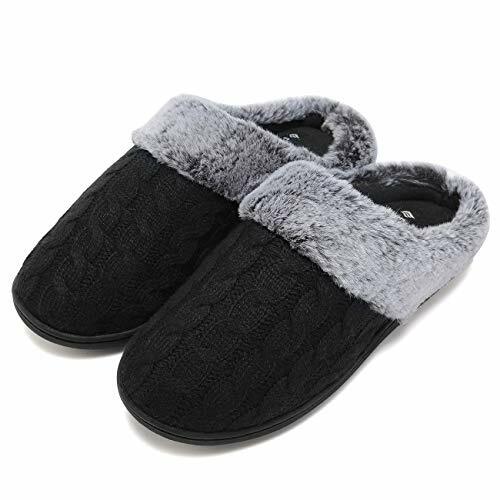 SUPER SOFT FAUX FUR LINING: Fully lined with super soft faux fur, just as cozy and comfy as real fur, these slippers can offer you a new wearing experience, they'll keep your feet warm and comfortable on cold autumn and winter nights. COMFORTABLE & WARM: High quality insole consists of one layer of premium high-density sponge + one layer of high elastic sponge heel, offers lasting comfort and warmth for tired toes and heels, reduces muscle fatigue, relieves pain and pressure after a long day hard work. ★★Sizing tip: Please ignore the size on the shoes and choose your right sizes based on the listing.EASY CARE: Machine wash with a laundry bag or hand wash, easily clean off stains or dirt. 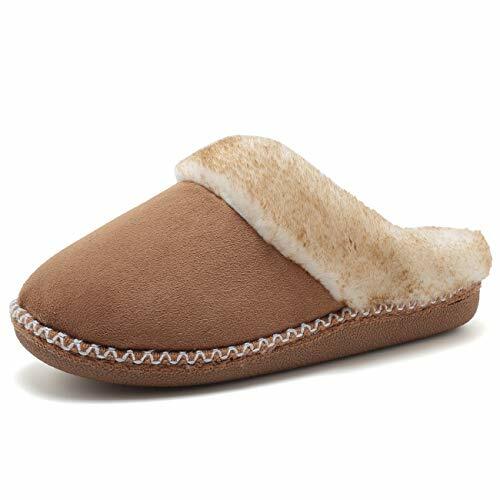 EXQUISITE CRAFT: Breathable suede upper with exquisite whipstitch, fully lined with faux fur, these clog slippers are in fashion design and keep your feet warm and comfortable on cold autumn and winter nights.